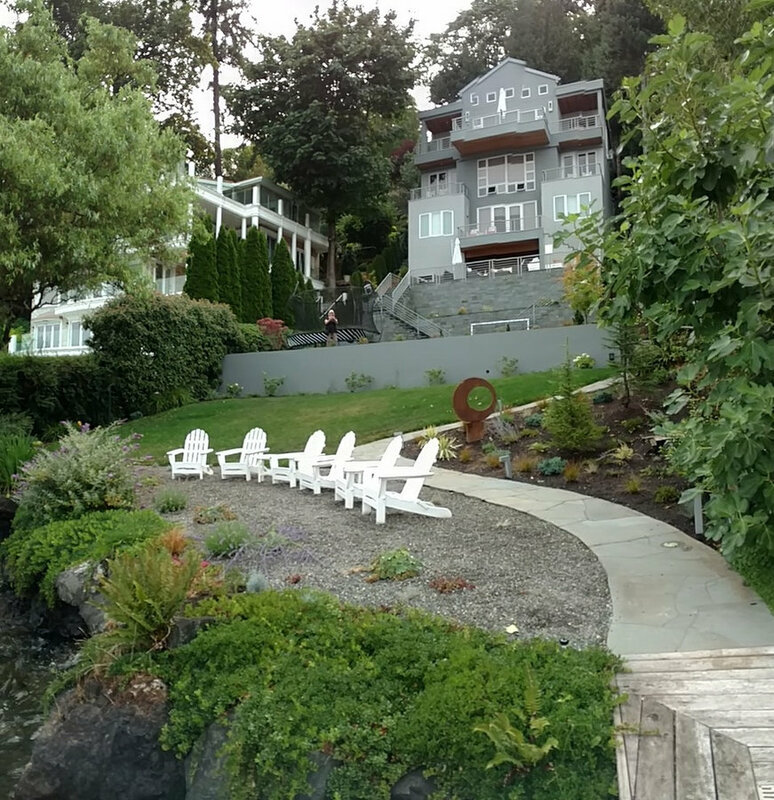 This multi-level young family's waterfront home needed a visual update and additional living amenities for outdoor enjoyment. 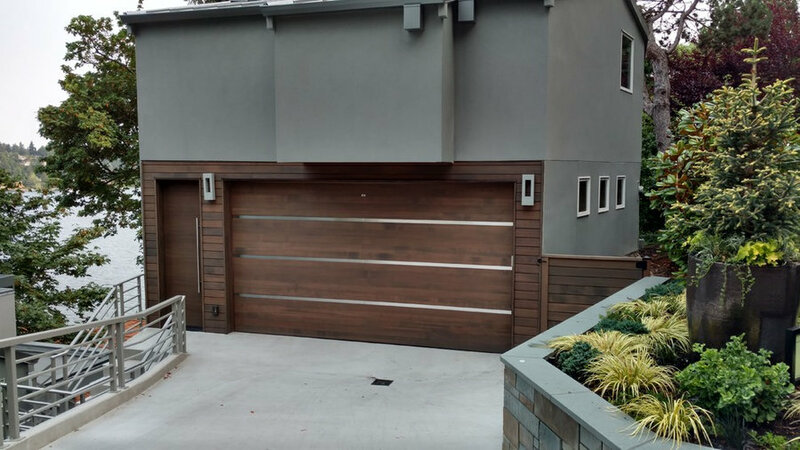 The entry is now welcoming with dark wood wrapping the garage & ADU, there are new matching wooden entry doors, all new street landscaping, and the utility bins are hidden behind a gate. 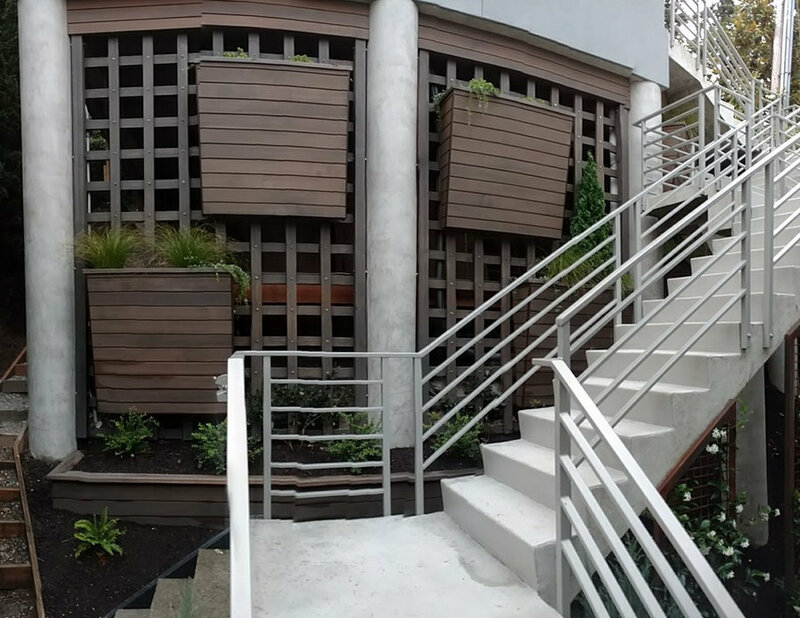 The site is very steep with over 90' of vertical drop between street level and the waterfront. New symmetrical staircases were added on the waterside, the planters stacking up the steep hill are now re-clad with steel, new safer secondary stairs connecting the entry to the shore level were reconfigured, an outdoor kitchen/living room was added, artificial turf replaced muddy winter grass for the kids, the exterior paint was darkened and several concrete walls were painted and others clad with a tailored stone wrap. Unneeded concrete was removed, healthy soil brought in, plants were barged in and planted everywhere. Outdoor lighting continues throughout with an updated contemporary style. Hardy plantings provide an abundance of colorful pops throughout the NW seasons. The general contractor was Tony Wood Construction and the home owner was involved in all aspects of the project. AFTER-- new paint, comtempory wooden-metal garage door, wood accents, large pot with conifer, refreshed plantings for 4 season interest. AFTER--Refreshed garage and ADU entry with wood and added wooden and metal garage door. Sconce lighting adds a modern look is used throughout the property. Gate to right of garage door now obscures the utility bins. Wall to the right is clad in stone repeated through the property. Upper building and railings are now painted with darker colors continued throughout. 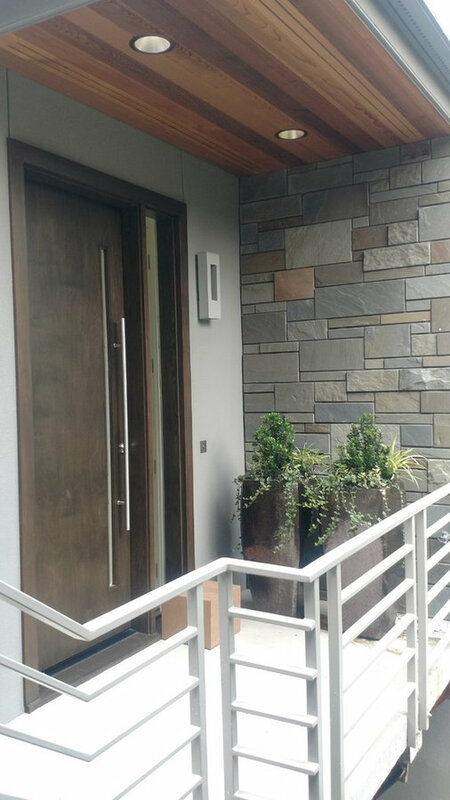 AFTER--New updated front door, wood soffits Hinkley outdoor lighting, and stone veneer accent walls. 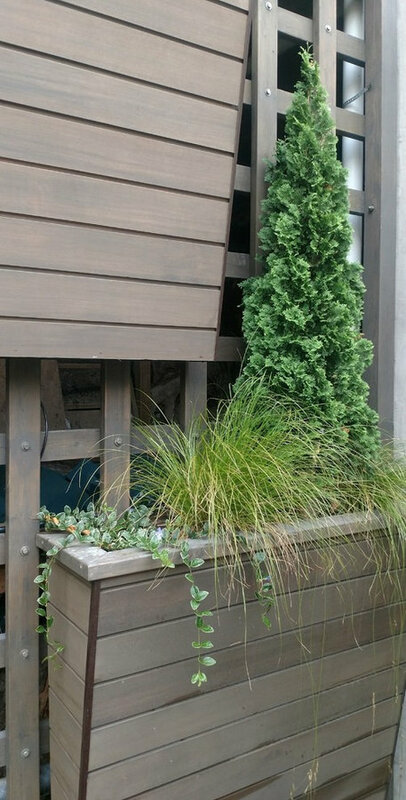 AFTER--The evergreen plants soften the extensive entry area wall of wood and concrete pillars. There are 5 custom large boxes with drip irrigation. AFTER--Viewed from the entry stairs and from within the home this area is now an attractive entry. 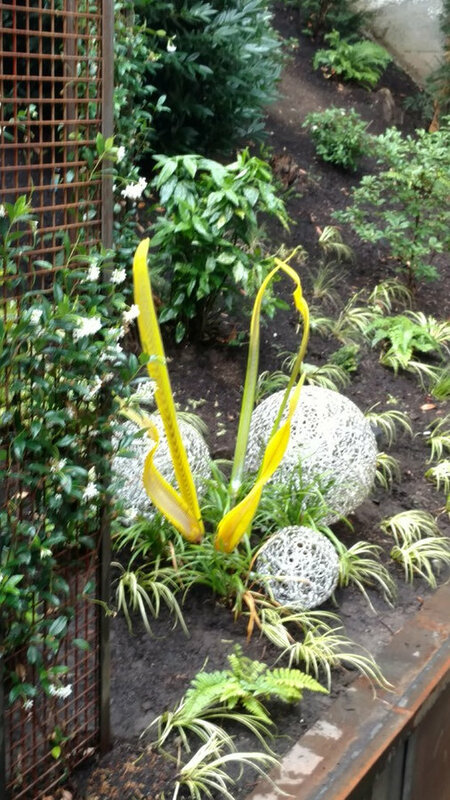 At night the 3 silver spheres light up and shine onto the glass 'leaves'. 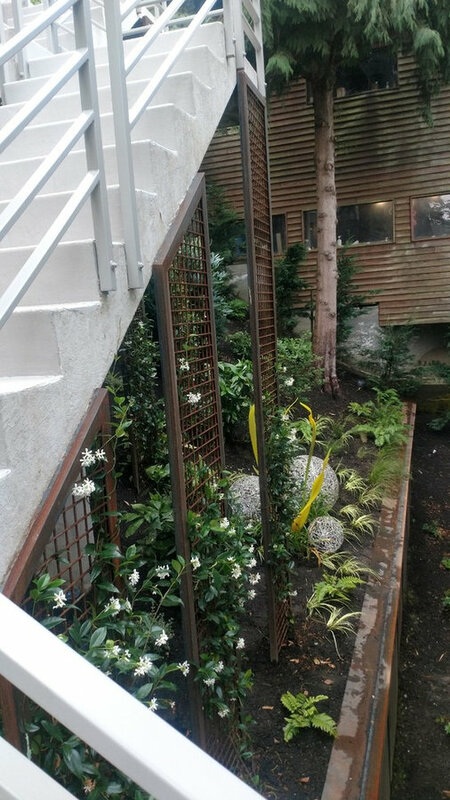 Vertical metal 'trellises link the stairs and the ground with climbing Star Jasmine vines. The scene pulls the eye away from the shady areas under the stairs. The lower retaining wall is steel clad. AFTER--A tight deck area is now an outdoor kitchen with all the needed elements. A table seats 6 and the sofa and chairs look out toward the lake and kids' play area. Client's furniture. 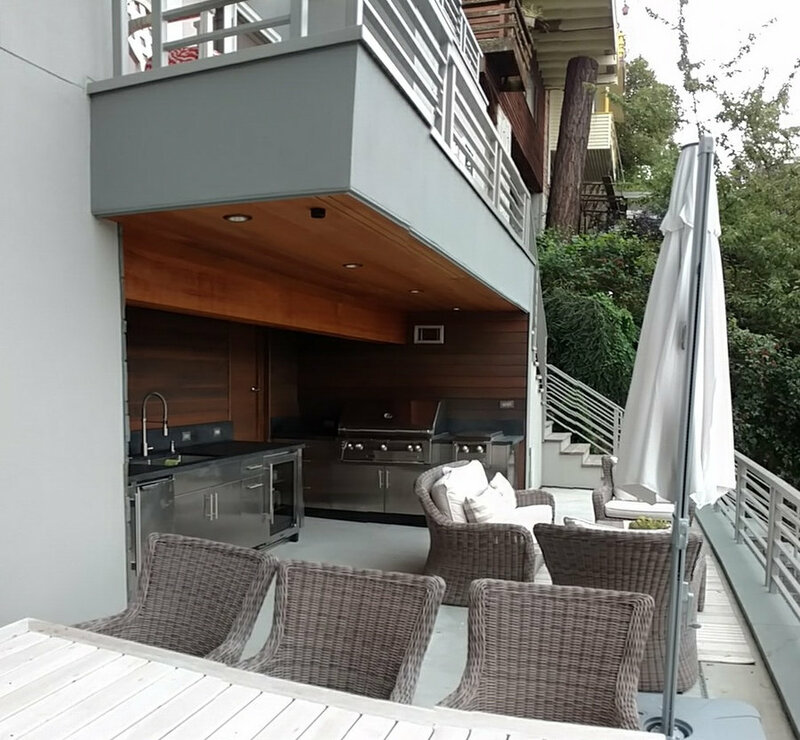 The new outdoor kitchen and comfortable entertainment space overlooks Lake Washington. 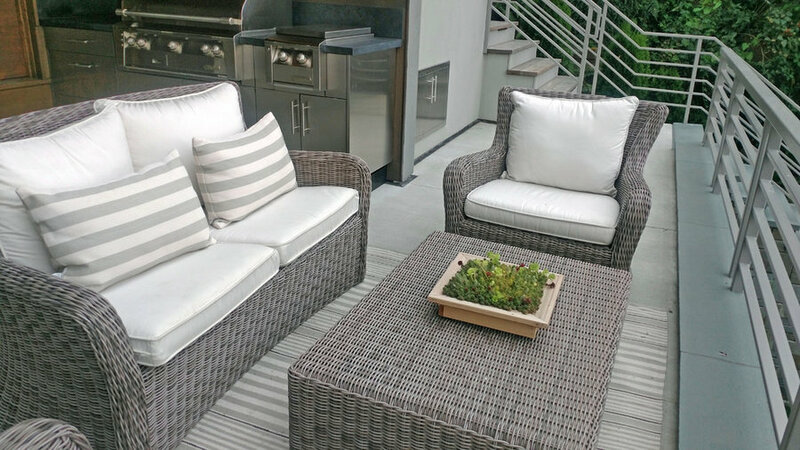 Neutral colors flow throughout the home's interior and exterior finishes. Furniture by client. New smaller furniture is coming. The new outdoor seating area and kitchen look down onto the kids' soccer and trampoline area. There is storage for lawn and water sports equipment under the stairs on the left. All the stone work was done by Bear Creek Masonry. The newly planted landscape will mature and soften the walls. 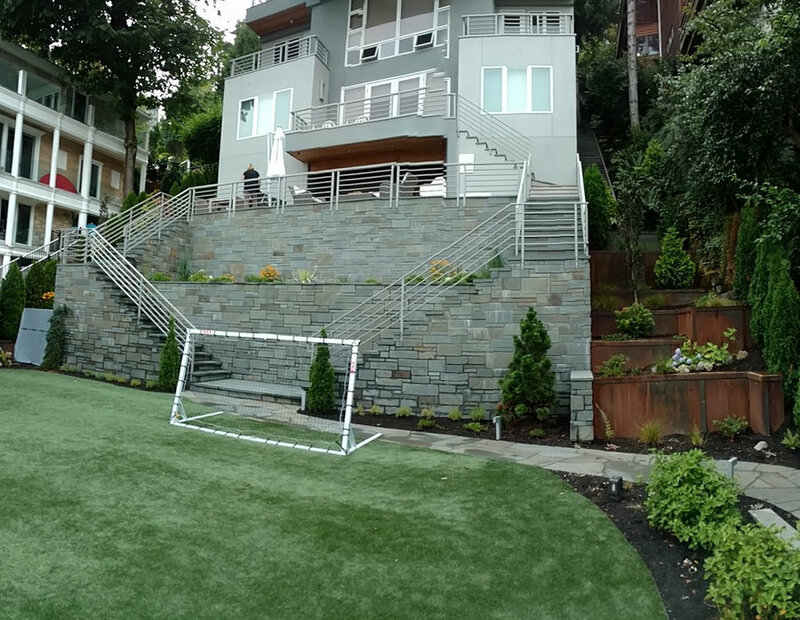 The new symmetrical stairs graciously wrap around a large planter to connect the upper entertainment area with the play area and the path leading to the lower beach and dock. Just planted materials will be lush and inviting. 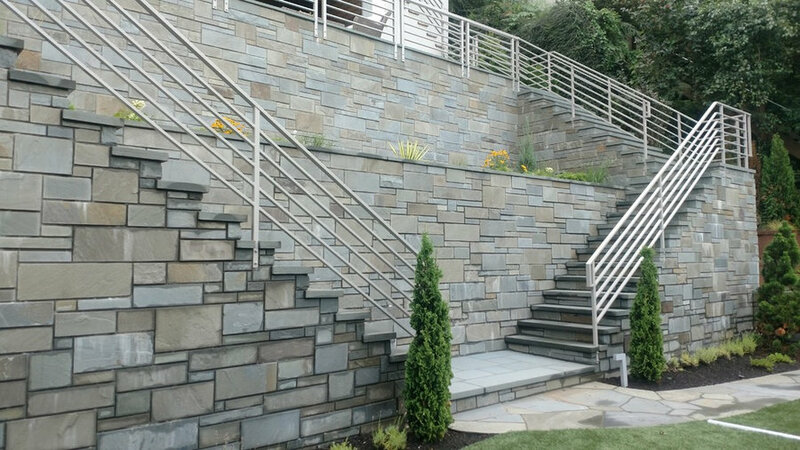 Classic, tailored stone pattern. 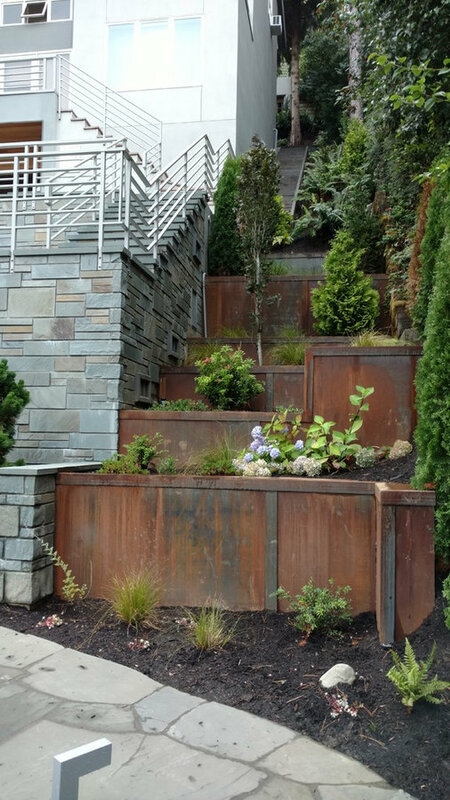 AFTER--Tiered steel clad planters flank the new stairs connecting to the waterfront. When the shrubs fill in they will provide more privacy. AFTER--Reconfigured twin staircases gracefully connect the living areas with the lakeside. The outdoor kitchen and dining area provide comfortable seating to watch the kids play below and enjoy sunsets over the lake. A metal fire bowl will nestle in front of the Adirondack chairs providing warmth on a cool evening. AFTER--The stone path curves around a custom sculpture designed by Land2c and fabricated by MOD Studio. New landscaping was installed to tolerate the strong winter winds off of the lake. The shoreline plantings are largely evergreen for good views throughout the year. 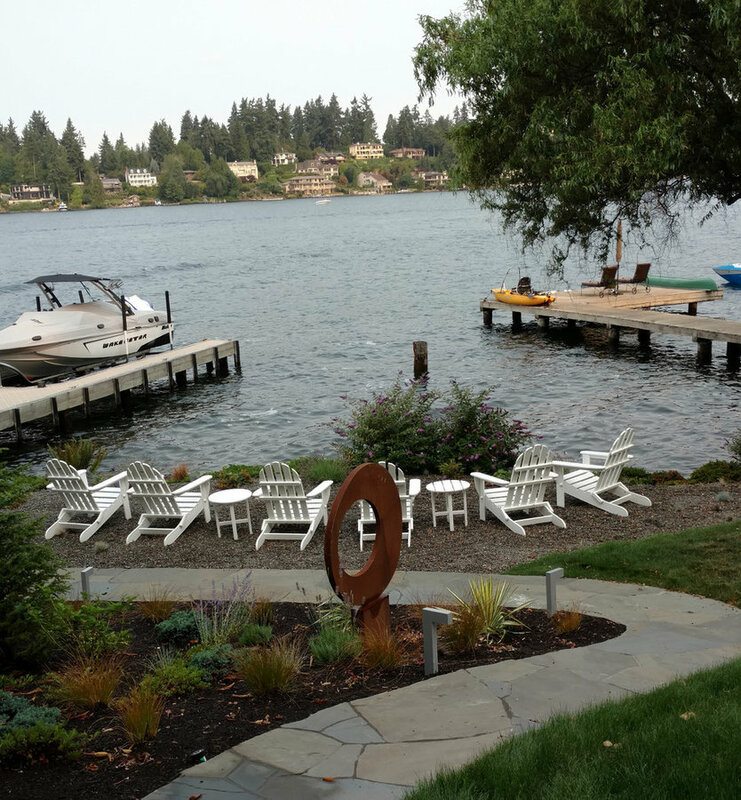 A pea gravel "beach" was added to create a dry, well drained seating area at the waters edge.